Hi, friends! My name is Jen Pinkston and I write the lifestyle blog, TheEffortlessChic.com. I couldn’t be more excited about guest posting over here today. We recently partnered with Room & Board to put together the dining space of my dreams and are still so enamored with the way it turned out. These images are of our dining space in our current rental house. In the fall we will be moving into the house that we’ve spent the last two years designing! Let me know if you would like to see an update of these pieces in the new space! For starters, I wanted the largest possible table that would fit in our dining room at our new space, without it feeling cramped. 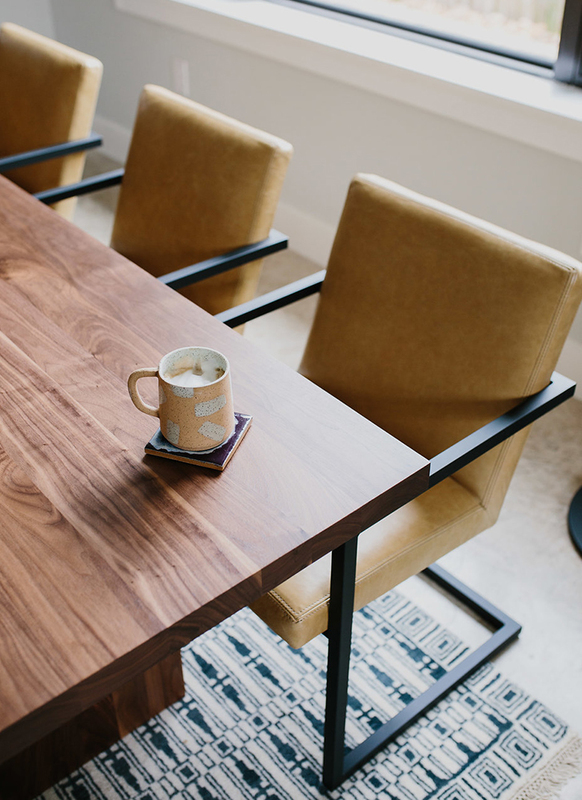 After months of thinking that I might want a round or oval table (both of which I love), I ended up choosing rectangular because it gives us the ability to swap in bench seating on one side and accommodate more people which was a real priority for me. I knew I wanted something simple and modern, not ornate, and that would fit with the mid-century vibe of our new place. 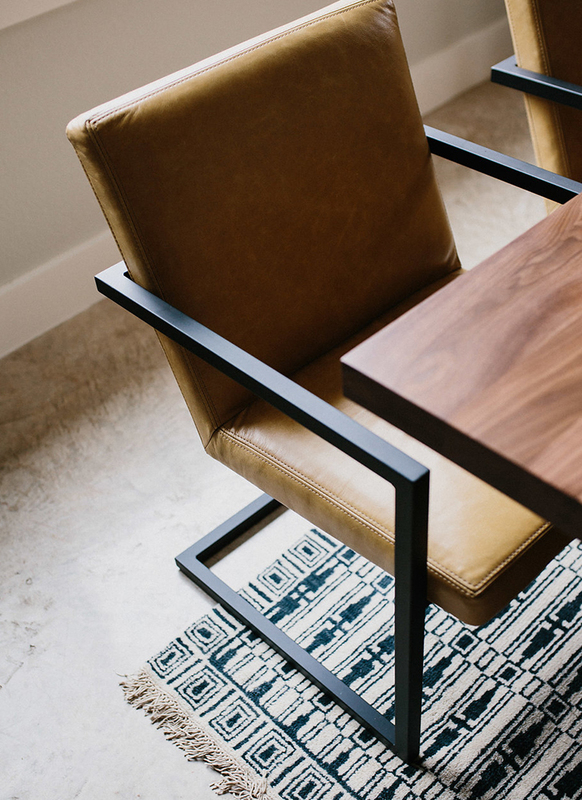 The Corbett table checked all of those boxes and it was seriously love at first sight. As for the wood tone, it comes in seven different stains and Aaron (my husband) and I went back and forth on a couple before settling on the walnut. He tends to like much darker woods and I am in a serious light wood phase, so the walnut was a compromise that we both liked. Seeing the table in person, though, I would choose this wood over and over again. It has such pretty color variation and feels really timeless. Seriously this is one of those purchases that I really liked online when I ordered it, but has exceeded every single expectation now that we have it here with us in person. I just can’t say enough about the quality or the beauty of the wood. These chairs tie into so many other finish details in our place. 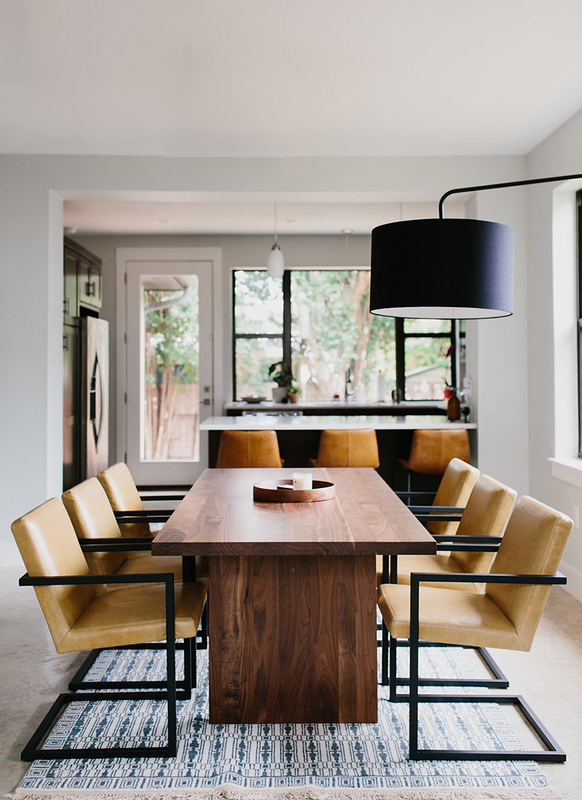 When we put together the style board for our house, I imagined really supple camel and brown leathers as a runner throughout the house, so I loved the idea of these Lira leather dining chairs. You get the comfort of something upholstered instead of wood, plastic, or metal, but they also clean up so much easier than their fabric counterparts. These chairs in the Portofino Cashew leather are so incredibly comfortable. We could (and sometimes do!) linger here for hours. Lastly, I love the black metal frame. Most of our finishes in our new place are matte black, so these will tie in perfectly. These Lira chairs somehow feel both modern and timeless which I love. To rug or not to rug under the dining table seems to be quite the hotly topic. I can see both sides. It certainly doesn’t feel like the most practical choice—especially with kids. On the other hand, with concrete floors in both our rental space and our new build it really feels like the room needs a rug to add warmth and also pattern. (The pattern will hopefully also strategically hide small spills, fingers crossed.) We chose to rug and couldn’t be happier with this Tulum rug. The colors are neutral but add the perfect dose of pattern to the space. Again, I feel like it’s still modern but in a timeless and not trendy way, which is actually how I would describe Room & Board as a whole and why I am probably so drawn to all of their pieces! 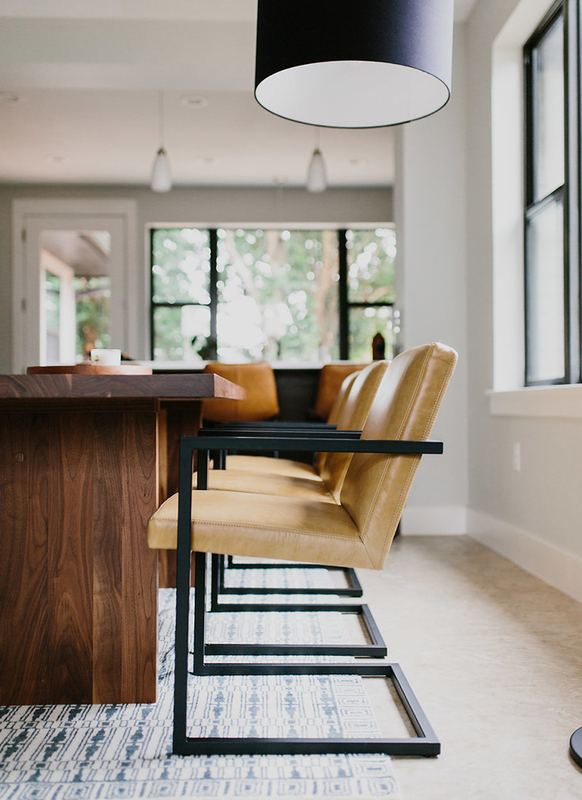 Jen chose a smaller rug to expose her concrete floors, however, we recommend leaving at least 24 inches of room on all sides to allow chairs to stay completely on the rug when pushed away from the table. See our rug guide for more tips! Since there isn’t a statement light fixture in our current dining space, this Rayne floor lamp helps to bring it all together and make the room feel complete. I love it. The arm swings and height adjusts and I can literally picture it in any room. Since the dining room in our new space will have a light fixture, we’ve talked about relocating it to the living room, play room or office once we move. Like I said, it could literally go in any room and make me so happy! I mentioned earlier that we partnered with Room & Board on this post and am happy to report that we have had such a great experience. When we lived in LA, we were always paying a visit to their Culver City store and ogling piece after countless piece for our place, so it was no surprise that out of the hundreds of tables that I looked at, the one I loved most belonged to Room & Board. We placed our order for the dining space pieces and received a delivery date. It was on time (a little earlier than expected actually) and we got a phone call to schedule the delivery a couple of weeks in advance. Then two days in advance the Room & Board delivery team called back with a two-hour window of when we could expect them. The guys arrived right in the middle of the delivery window and effortlessly came in, put everything together, placed it where we wanted, and then removed any cardboard or trash that was left behind. It was completely effortless on our part and such a great experience! If only every delivery was so seamless! 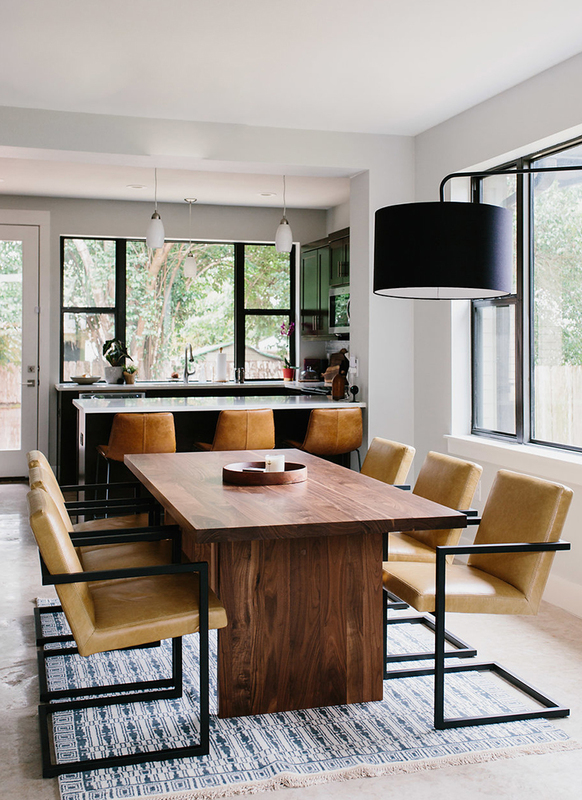 The Room & Board product featured in this post was gifted to Jen Pinkston for her dining space. All opinions are her own. The rug is way too small, and the lamp looks out of place. Love those chairs and the table but that’s it. I’m tired of seeing blogger-collaborations . Design is something people study for a reason and putting a bunch of beautiful furniture in a room, professionally photographing it, will always be pretty. But this design lacks personality and substance and reflects more like a catalog shot (show me toys on the floor, a coffee stained newspaper, or a pet). I’d be interested in seeing what a designer, or other professional in the visual arts could do with a space. That would be really cool. Thanks for sharing your thoughts, Virginia! We will keep it in mind for future partnerships.